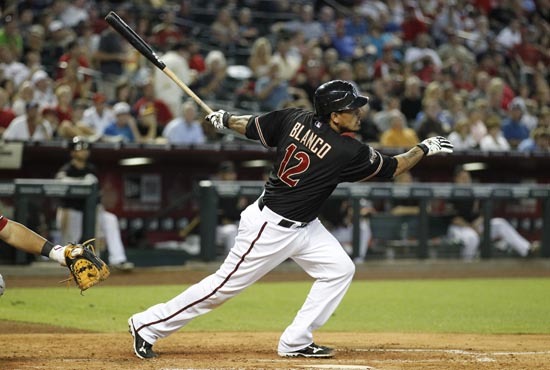 The Arizona bats were unusually quiet during the first two games of the National League Division Series in Milwaukee. That all changed when the D-backs returned home to Chase Field for Game 3. The offense smacked 11 hits for eight runs, including a grand slam off the bat of Paul Goldschmidt. Four different players in the starting lineup collected multi-hit games, including Willie Bloomquist’s three-hit performance. The Brewers and D-backs return to Chase Field for Game 4 tonight, and the red-hot Arizona lineup will face off against veteran Randy Wolf. For Wolf, navigating through the hot-hitting D-backs batting order will be a far from easy task. Many D-backs players have had success against the Milwaukee southpaw. Chris Young, Justin Upton, Ryan Roberts, Gerardo Parra and Lyle Overbay have all homered off the Wolf in their careers. The 12 Arizona hitters that have faced Wolf before have combined for a .328 batting average, .542 slugging percentage and 24 RBI all-time. Young is a career .296 hitter off Wolf with a homer, three doubles and three walks. Henry Blanco has hit .357 lifetime vs. Wolf in 14 at-bats, while Roberts is a career .462 hitter against the lefty. Geoff Blum has tallied five hits in 13 at-bats off Wolf along with five RBI. Bloomquist is always a .300 hitter when facing Wolf. Additionally, Miguel Montero owns a .500 career batting average off Wolf to go with two RBI. Wolf is aware of the challenge that lies ahead as the Brewers and D-backs square off in game number four.